As our climate spirals hotter into new and unfamiliar territory, we are seeing enormous stresses destabilizing our weather patterns, crops, water supplies, infrastructure, global supply chains, and civilization itself. To face our collective global climate change emergency we must deploy technologies to stabilize climate while we slash fossil fuel emissions, and remove carbon from the air and water. I discuss how sulphur dioxide affects our climate. Concern for accelerated, even exponential climate change is skyrocketing. A few videos ago I discussed the story of energy changes at the Earth surface and how it affects climate change. This topic is a bit complicated, and I felt it was worthwhile to revisit/explain it from a different angle to break the glaze that has formed in some viewers eyes:). Paul Crutzen, the Yoda of atmospheric science , played a large role in human understanding and action on ozone holes, got a Nobel Prize in 1995 and coined the phrase Anthropocene. 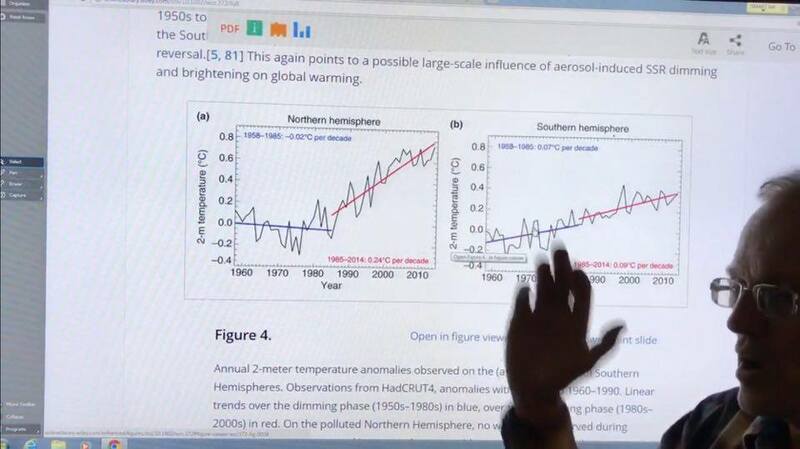 I attempt to explain, in layperson terms, how the science shows that we can temporarily stop abrupt climate change in its tracks, buying some time to slash fossil fuel emissions and remove carbon dioxide from the atmosphere/oceans. Anthropogenic Arctic Volcano Can Calm Climate, Jan 10, 2013, by Paul Beckwith: ‘Rational decision making requires realistic risk assessments of alternatives. Humanity is now choosing default door A, which is no change in behavior with fossil fuel energy sourcing and a continuance of rapidly rising anthropogenic greenhouse gas emissions (GHGs). ‘Abrupt collapse of Arctic albedo due to collapsing terrestrial snow cover (area dropping 17.6% per decade for past three decades) and collapse of sea ice cover (area dropping 49% below 1979 to 2000 long term average) is occurring (NOAA 2012 Arctic Report Card from last week)’ . Article continues in full, at link. ‘The Nobel Prize in Chemistry 1995, Paul J. Crutzen, Mario J. Molina, F. Sherwood Rowland. Paul J. Crutzen – Curriculum Vitae: The following is the curriculum vitae of Paul Josef Crutzen, born 3 December, 1933, in Amsterdam, Holland, Director at the Max-Planck-Institute for Chemistry in Mainz, Germany. He is married, with two children.’ Continues at link. This entry was posted in New Video, Videos and tagged Abrupt Climate Change, Anthropogenic Arctic Volcano, Paul Crutzen, Three Legged Stool: Zero Emissions - CDR - SRM, z Aerosol Affects, z Radiative Affects, z Radiative Energy, z Rational Decision Making Needs Realistic Risk Assessments, z SSR Surface Solar Radiation - Shortwave. Bookmark the permalink. Extreme problems may involve extreme solutions . One thing is the deep ocean is about 4C if we can get that cold water to the surface using a inclined pipe and say a solar powered pump to assist in circulation up the inclined pipe say at an snhje of 30 degrees we can get a thermal circulation system going and chill the water are the top with cold water from the bottom. Another is a NON nuclear missile into a suitable volcano as advised by Volcanologists to get sulpher and ash high into the upper atmosphere to create a cooling effect. Solar salt poet furnaces could be used to force the warm area at the top of the ocean to the bottom cold ocean not only chilling it but forcing the cold water up up the surface to further chill the water temperature on an industrial scale. Encourage everyone to paint all building roofs white to further reflect light and heat back into the atmosphere in mid latitude areas through to polar regions. They say their is a concrete that absorbs carbon as it sets ….make all new concrete this way WORLD WIDE ( this was shown on ABC Catalyst program on TV some years ago.